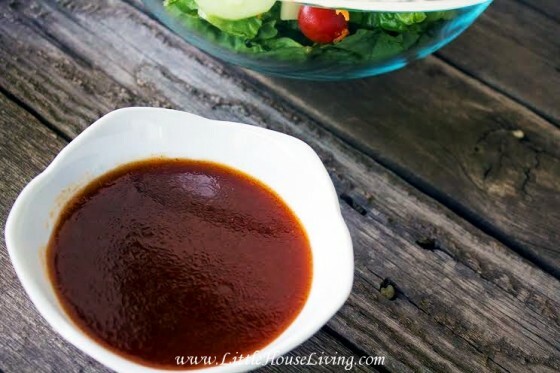 This homemade Catalina dressing recipe is so easy and so tasty that you will want to make it over and over again. Use it to brighten up any fresh garden salad. You could even use it for another simple dish that needs a great tangy sauce, such as taco salad. My winter garden is coming along quite nicely already. My beans are growing like weeds and my lettuce is finally big enough to harvest from. So this week I wanted to make something a little different instead of our normal Homemade Ranch Dressing or Homemade Russian Dressing. I decided to try out a new recipe for Catalina salad dressing. This recipe turned out to be so simple and tasty that it’s definitely going to become part of our regular salad dressing rotation! I love making it homemade because it tastes so fresh, no matter what time of year it is! I think I especially love it in winter because a fresh salad in the middle of winter always reminds me of warmer, sunnier summer days. How about you? — Love simple recipes like this one? You may really enjoy my book, Little House Living: The Make Your Own Guide to a Frugal, Simple, and Self-Sufficient Life. It’s filled with over 130 mix and DIY recipes and projects that are easy to make. Place all the ingredients together in the blender. Pulse until everything is mixed together. 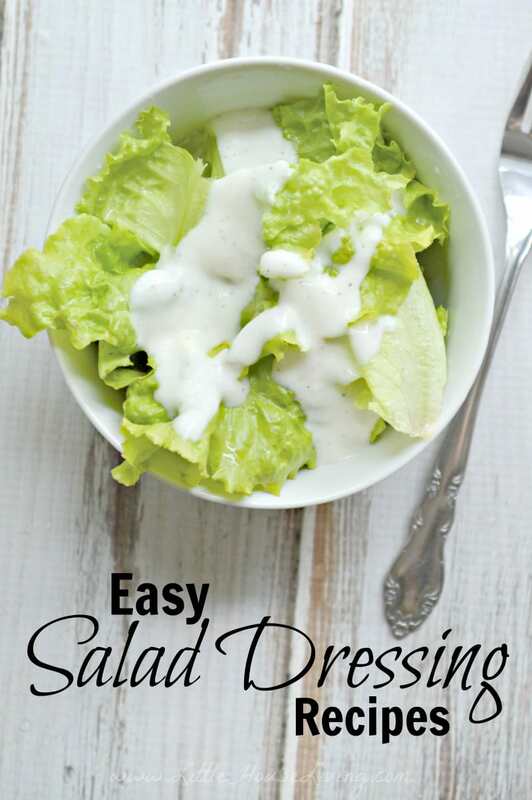 Store the dressing in a container or a jar in the fridge and use over salads or any of your favorite meals. This dressing will stay good for at least a week when stored in the refrigerator. Another meal that we really enjoy in the winter is taco salads (with homemade taco seasoning of course). 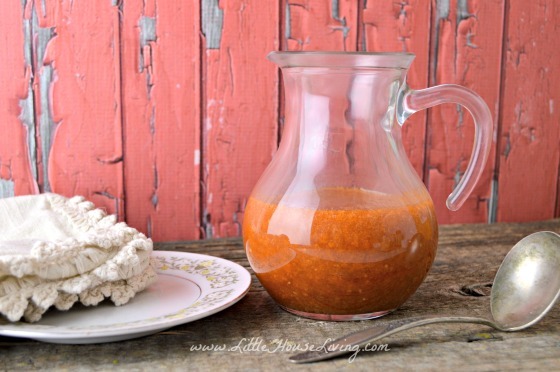 This homemade Catalina Dressing recipe makes a great topping for that as well! Another great option is to dress a cold pasta salad in this dressing in the summertime. Catalina dressing on a homemade pasta salad makes a great dish for a family BBQ! But alas, it’s still cold and snowy here. I’m hoping that soon we’ll have more fresh produce from our winter garden that we can add into our meals. The beans are growing well and I hope to add a few broccoli plants into the mix as well. What about you? What are you growing in your garden right now? 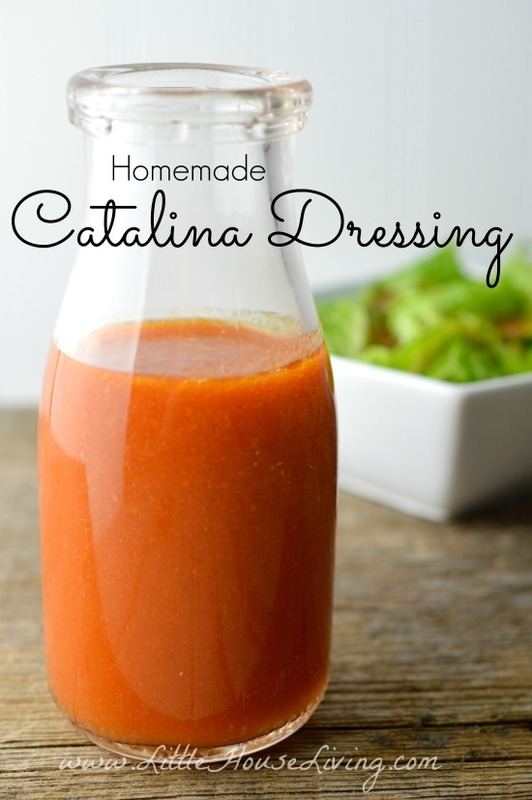 Have you ever made your own Catalina dressing before? Is your recipe the same or different? 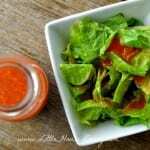 Need to print this Homemade Catalina Dressing recipe? Grab it below! 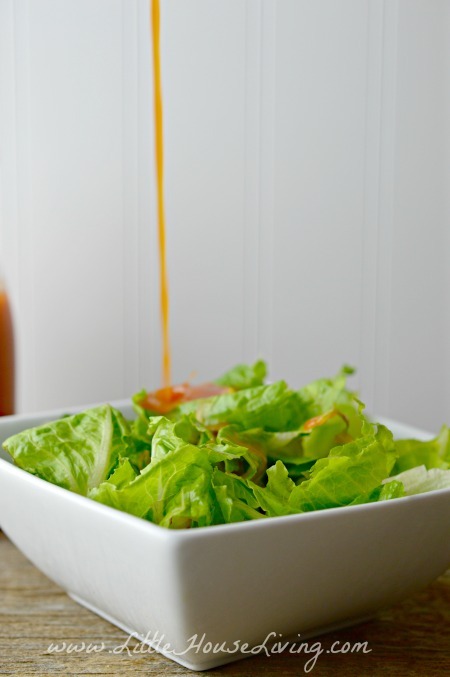 This Catalina dressing recipe is so easy and so tasty that you you'll want to make it over and over again. Use it to brighten up any fresh garden salad, taco salad or pasta salad! Place all the ingredients together in the blender. Pulse until everything is mixed together. 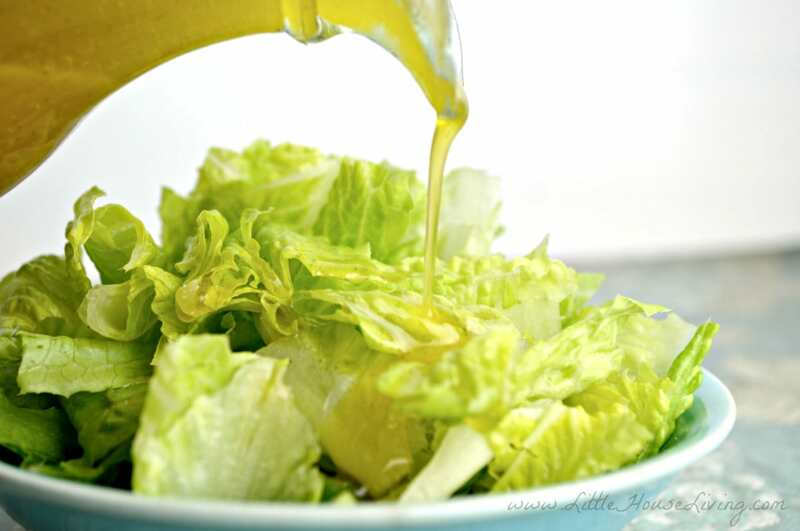 Store the dressing in a container or a jar in the fridge and use over salads or any of your favorite meals. This dressing will stay good for at least a week when stored in the refrigerator. Looking for another new and unique homemade dressing recipe to try? Check out this Homemade Dorthy Lynch Dressing. It’s one of our family favorites! 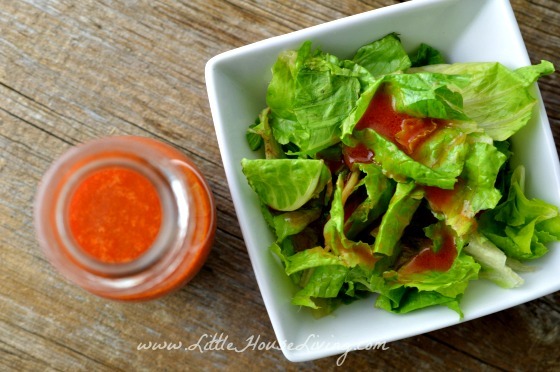 This Catalina Dressing Recipe was originally published on Little House Living in Dec 2014. It has been updated as of February 2019. I look forward to trying this! We use Catalina dressing to make Catalina meatballs – first saute about 2 onions in a pan, and get them nice and carmelized. Then put some meatballs on top of the onions (frozen – either store brand or homemade) and pour over your Catalina dressing. Cover and let simmer until the meatballs are nice and hot. I like to serve this with some egg noodles, but you can serve it with rice, too. I also top my portion with sour cream. So yummy! Thank you for sharing that recipe, it sounds great! Is this salad green(s)that you are growing in your Aerogarden device and are you satisfied with them or totally impressed?? Those greens look great w/ homemade any kind of dressing!! Thanks for sharing! This is a mix of greens, some from the store and some from the garden. I’m really more of a fan of romaine type lettuces so I like that in my salad and I’m not sure I could grow that in the areogarden. I plan on planting some in a plastic tote though were it can grow a little bigger. If I wantes to make honey Catalina that they have on grocery store shelves, how would I factor in the honey. I haven’t had that one but I would guess that you could just replace the sugar in this recipe with honey? We just enjoyed this dressing with a salad at our family Christmas Eve dinner- it was a big hit! Thanks- Merry Christmas!! I love making my own salad dressings! So far I haven’t come up with a good catalina or French version, but this one looks promising. Can’t wait to try it! Your homemade Catalina Salad Dressing sounds delicious. Thank you so much for sharing this with Foodie Friends Friday party this weekend. We’ve pinned/shared and look forward to seeing you again soon with another delicious recipe. Look yummy. shared. Thanks for joining the #InspirationSpotlight party. Hi Merissa, Just popped by to let you know your salad dressing recipe was featured at the Inspiration Spotlight party! & pinned to our features board. What kind of oil do you use in this recipe? Thank you. Personally I use olive oil in this recipe. It has a little more of a robust flavor than other vegetable oils but it’s usually what we have on hand. I left out the oil and it was really good! I’m looking forward to making this soon. Here’s a recipe for you that sounds really weird but is fabulous. That said, it is not for everyone but try it, you may like it. Take a casserole dish that will hold your chicken in a single layer and grease it. Put the chicken in the dish, cover with the sauerkraut evenly. Pour the dressing over top making sure to cover the entire layer of sauerkraut. Cover with Swiss cheese. Cover with foil and bake at 350 for about an hour until chicken is cooked through. I serve this with buttered noodles and green beans. Personally I have tried this with other side dishes and vegetables but these two were the best. Hope you enjoy! Sounds good to me! Thanks for sharing! We are not ketchup people so never have it in the house. I’m thinking about subbing it with tomato paste, maybe a bit of extra water or oil and some agave to sweeten it up. What do you think? You can always give it a try and see how it tastes. Otherwise, you could make a bit of Homemade Ketchup. I made it for the first time and it tastes pretty good. To me it was a little to vinegary for my taste. How much should I reduce the vinegar? Or should I try a different type of vinegar? I’ll probably reduce the sugar just a little bit. It was very good and very close tasting to the store bought Catalina. Thanks for the great recipe. Yes, you can try a different kind of vinegar. What kind did you use? I used the apple cider vinegar. I did finish the first batch and made it again and reduced the sugar and vinegar to 1/8 cup. It came out so delicious and just right. So I’m gonna make a double batch to fill a whole bottle. ? I made this tonight and it is delicious! I added about half a teaspoon of hot honey mustard and poured the oil into the blender slowly while it was running to ensure a good emulsification. Definitely exceeded my expectations.